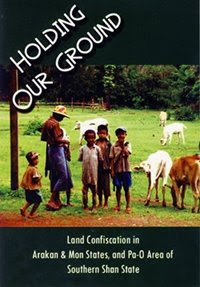 A new report released today called “Holding Our Ground” decries that the Burma’s military junta’s dual policy of expanding militarization and land confiscation has been causing people to face widespread problems such as food and water shortages and instability. 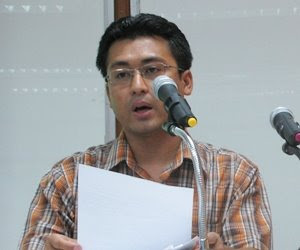 The report particularly focuses on three ethnic areas of Burma: Arakan State, Mon State and Pao-O region of southern Shan State, documented by three grassroots organizations: All Arakan Students and Youth Congress (AASYC), Mon Youth Progressive Organization(NYPO) and Pa-O Youth Organization(PYO). Most people from those areas were rural people who engage in many kinds of agriculture and farmers who depend on their lands and farms to cultivate various kinds of food and vegetables for their living. The report says the reason for land confiscation is the need to feed and financially support increasing troop numbers whose top generals have imposed a policy of self reliance where the Army must produce its own food and obtain basic materials, but also every unit has to raise fund by itself. Each battalion is assigned 280 acres of land to produce rice plus 2 acres for every soldier who has a family to feed, according to a 2005 report by Nationalities Youth Forum (NYF). “Lands were confiscated with little or no compensation being given to the owners,” said Aung Marm Oo from AASYC. Another is the junta’s construction and development projects which has led to several forced labor, disastrous environmental effects and violence against ethnic nationalities and sexual harassment of local women and girls. “Local villagers were forced to go for road construction, work in military barracks and have to act as guides for troops in search of rebel groups,” he added. 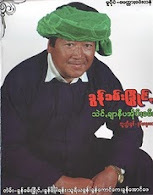 For instance, villagers in Nawng Day village, Hopong township, southern Shan State were forced to porter for the Burmese Army at least two or three times in a week from November 7, 2007 to January 1, 2008, ultimately forcing 9 of the village’s 16 households to leave. The dual policy has also resulted in forced relocation. It is estimated that between 600,000 and 1 million people are being internally displaced people (IDPs) and most are fleeing to its neighboring countries such as Thailand, China, Malaysia and Bangladesh to seek better life. “That is also the reason why the number of migration in the neighboring countries has been increasing,” Aung Marm Oo added. In Burma, there were 215 infantry battalions (IB) and 340 light infantry battalions (LIB) in September 2006, according to Network for Democracy and Development (NDD), a dissident group that has been monitoring the Tatmadaw (Burma’s armed forces) for years. And about 30% of them are reported to be in Shan State.